Cytotoxic T cells (CTLs) take a central part in tumor cell destruction. Initially, naïve CD8+ T cells are primed by antigen presenting cells in lymphoid tissue or, alternatively, by antigen processing tumor cells at the tumor microenvironment. The contact region of CTLs with antigen bearing cells, the immune synapse, consists of clusters of T cell receptors and adhesion molecules with reorientation of the cytoskeleton to direct secretion of cytotoxic molecules to a specific location. Membrane fragments carrying surface peptide-MHC complexes are captured by tumor responsive CTLs. The incorporation of tumor membrane exposes CTLs to fratricide killing, or turns them to secondary APCs. Activated CTLs release cytotoxins including perforin and Granzyme B, which activate several pathways leading to apoptosis and target cell death. Membrane bound proteins of the tumor necrosis factor receptor family induce cell damage, and do not necessitate perforin activation. 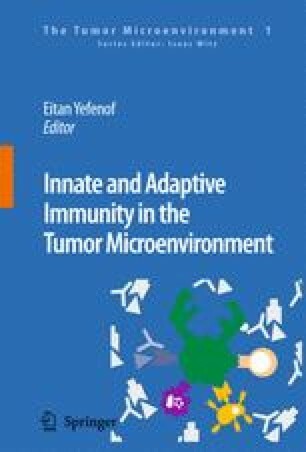 Interferon-γ is an important cytokine secreted by activated CTLs essential for tumor regression through its paracrine effect on other immune cells and generation of inflammation. With the advent of gene transfer to T lymphocytes, the major goal in the future will be to increase the tumor destructive properties of CTLs and amplify immune response.